Credit: Guilhem Vellut/Flickr/CC BY 2.0 licensed under . As the name suggests, Kita ward or Kita City (北 kita means north in English) is located in the northern part of Tokyo. The narrow ward is sandwiched between Adachi and Nerima wards and borders the neighbouring prefecture of Saitama. It is transected by four rivers and many of the river banks are lined by areas of greenery. Kita ward is home to several art and craft museums that showcase its history as a borough of artists, writers and artisans. On its southern tip, the ward encompasses Tabata Station, which is located on the Yamanote ring line that encircles central Tokyo. While offering good commuting connections on the North-South axis, the ward has a retro and suburban flair, and is dotted with several important shrines and small shopping and restaurant streets that date back to the Showa era. Until a little over a century ago, the area that is now Kita ward was nothing more than a collection of rural villages and towns. In the 1880s, it was connected to central Tokyo by rail via Oji Station and it soon became a quarter popular with starving artists and writers thanks to low rents compared to the city. These roots are still preserved today with a number of interesting museums like the Paper Museum and the Memorial Museum of Artists and Writers. The ward also has several scenic green areas that are enjoyed by its inhabitants. Transected by the Arakawa, Sumida, Shakujii, and Shingashi rivers, many of the riverbanks invite the locals for a run or a picnic during the summer months. Kita ward is further home to Oji Shrine, one of Tokyo’s ten most important shrines, Asukayama Park next to Oji Station famed for its cherry blossoms, and Kyu-Furukawa Gardens, a designated National Place of Scenic Beauty. The gardens have both a traditional Japanese and an English part, which attracts thousands of visitors for the annual rose festival. The gardens are crowned by a traditional British mansion. Skyscrapers and large-scale shopping malls are absent from Kita ward. Around most stations, locals will find shotengai — small alleys lined with traditional shops and restaurants. The ward has retro flair and slow life vibe so it comes as no surprise that it is favoured by older residents of Tokyo. Kita ward has a population of 349,056 as of 2018. With a population density of 16,912 inhabitants per square kilometer, it is on the lower end of the scale of Tokyo wards. With an area of 20.61 square kilometers, it is also one of the smaller wards, sandwiched between Adachi and Nerima ward and the neighbouring prefecture of Saitama. Kita’s foreign population clocks in at 20,994, which is fairly high in comparison to its total population. 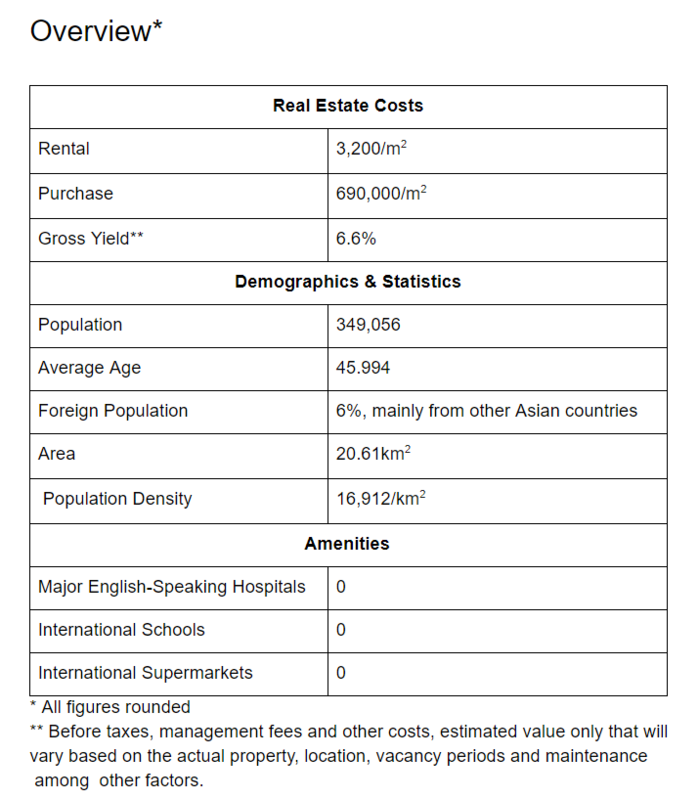 Large parts of the foreign population seem to be made up by immigrants from other Asian countries that value the ward’s cheap rents. It is also the second-oldest ward with an average age of residents around 46 years, only beaten by Taito Ward. Akabane Station is close to several big supermarkets, including Ito Yokado, Seiyu, and Daiei, as well as two shopping malls, and Lala Garden, a covered shopping street. Around Oji Station, one can find Tobu Store and Summit, two large and well-stocked supermarkets. For the rest of ward, most stations offer shotengai — narrow shopping streets lined with small, usually independent shops offering a mixed bag of wares and services and smaller supermarkets. For international supermarkets, you would need to travel to central Tokyo areas that are frequented by expats, like Hiroo or Azabu. However, there is a Kaldi Coffee Farm close to Akabane Station which stocks international wine, sweets, cheeses and other goods. The more urban Tabata Station is connected to an Atrevie shopping mall. While on the smaller side, it is handy for some quick shopping and grabbing a bite. No notable English-speaking hospitals serve Kita ward. The Oji COOP Hospital, Akabane Central General Hospital, and Kamiya Hospital are the main hospitals in Kita. There are gyms, including 24-hour gyms like Anytime Fitness, located all across the ward. No international schools have campuses in Kita ward. Tabata on the Yamanote Line is the busiest station of the district, located in its southernmost corner. From there, it is a 15-minute journey to Tokyo Station and 18 minutes to Shinjuku Station. To Haneda Airport, you are looking at a 45-minute trip, while for Narita Airport you should budget around 1 hour 15 minutes or more, depending on the connection. For Akabane, a busy commuter station located on the Keihin Tohoku Line with a direct connection to Tabata, add 15 minutes to these commute times. For Oji on the same line, add 10 minutes. Residential properties in Kita sell for JPY 825,000/m² for new buildings that are around 5 years old, while older buildings of 30 years will sell for JPY 570,000/m² on average. The average rent in a newly built apartment or mansion is JPY 3,500/m² on average, while landlords can still charge JPY 2,880 yen/m² in a dated 30-year-old property. This heavy rent distortion makes Kita an interesting place for investments in older buildings. Especially buildings around the 20-year mark are worth considering: While you can still charge an average of JPY 3,120/m² in rent, purchasing will set you back around JPY 620,000/m², more than JPY 200,000/m² less than a brand-new property. A 20-year-old building is almost fully depreciated, but at the same time at least 10 years, possibly even 20 or more years, of the property’s lifetime still remain.